Speed is the rate of motion, or the rate of change of position. It is expressed as distance moved (d) per unit of time(t). Speed is a scalar quantity with dimensions distance/time. Speed is measured in the same physical units of measurement as velocity, but does not contain an element of direction. Speed is thus the magnitude component of velocity. Velocity contains both the magnitude and direction components. The speed of long distance jogging for average persons is about 6 mph (~10 km/h, 2.7 m/s). Top athletic sprinters can run at 23.03 mph (~36.85 km/h, 10.24 m/s) within a short distance such as a 200 meters dash. 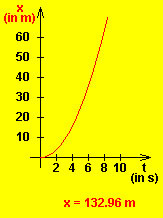 Acceleration, (symbol: a) is defined as the rate of change of velocity. It is thus a vector quantity with dimension length/time². In SI units, acceleration is measured in meters/second². To accelerate an object is to change its velocity, which is accomplished by altering either its speed or direction (like in case of uniform circular motion) in relation to time. Acceleration can have positive and negative values. Any time that the sign (+ or -) of the acceleration is the same as the sign of the velocity, the object will speed up. If the signs are opposite, the object will slow down. Acceleration is a vector quantity. When either velocity or direction changes, there is acceleration (or deceleration). To accelerate an object requires the application of a force. A car accelerates from rest. The following two graphs are created using a java applet (see below). The graph of velocity (m/sec.) vs. time (sec.) is a straight line for accelerating objects. 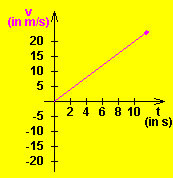 acceleration = velocity / time What is the slope of this graph? The graph of distance (x) vs. time (t) is a curve where the equation of motion is: x = 1/2 at². What value of (a) would you expect for this graph? Hint: For each value of t (in s), there is only one value for x (in m). Pick any ordered pair for t and x and substitute them into the above equation. Then solve for a. Create your own graphs for accelerating objects using the following java applet: This HTML5 app by Walter Fendt shows a car moving with constant acceleration. The green control panel contains text fields where you can vary the values of initial position, initial velocity and acceleration (don't forget to press the "Enter" key!). By using the buttons at the top right you can bring the car back to its initial position or stop and resume the simulation. If you choose the option "Slow motion", the movement will be ten times slower. 2. Which of the following are true about acceleration? c) Acceleration can be either + or - in value. 3. In the graph shown above for an accelerating object, the acceleration is closest to?